A Sincere Thank You From Us To You! We are astonished over the outcry of support we’ve received from our fans, friends and family regarding the INDIEGOGO Campaign for In The Pines. We are over half way there (59% to be exact) and still another 18 days to go! We appreciate all that have taken the time to check out our fundraiser, and to those who have donated or shared. Seriously, we can’t stress enough as to how important it is to share our campaign with others. To those who have: It has been super helpful. If you know anyone who may be interested in our project, please don’t hesitate to share this post! We are reaching out to you, Neon Reel Fans. Although we have a great script, most of our locations and talent, we are lacking in equipment for our latest endeavor, In The Pines. After making AWAKE in 2013, I set out to make a few films. Lost in a world of no direction, and an ever evolving social life, I became frustrated. Making films began as a hobby–it was a means to communicate a thought or a feeling. Stanley Kubrick once said “A film is – or should be – more like music than like fiction. It should be a progression of moods and feelings. The theme, what’s behind the emotion, the meaning, all that comes later.” That is how it was when making AWAKE. Originally, a good friend of mine, Rob Talbert, came to me with a short story. To be honest, I don’t think it had a name, but it did have a vibe about it that struck my attention immediately. If I can recall correctly, it was about a Man who was lost in the heart of a family get-together. He was an alcoholic who didn’t fit in. The man eventually gets away from the gathering and stumbles across two unknown life-forms in the woods. I had asked Rob if he was okay with me taking the heart of the story and letting it run free in my mind. Because of this, I was able to express my views on the wondering souls that lurk throughout our social circles. The ones who’ve changed, or left the circle because the circle changed. Sometimes people alienate themselves–they become self-aware of their own faults, and even worse, the faults of those around them. Instead of having a diatribe of social commentary between friends, the endless monologues play in ones head on a loop; broken records and broken dreams. AWAKE was a great experience. It was the first time I had worked with Doc Gregory. His raw emotion and attention to detail was impressive, and he had a witty sense of humor. I knew I wanted to write him something deeper–something that would take him somewhere deep–maybe his own abyss. A few films have come and gone since AWAKE. Some came to fruition and some faded away. The ones that faded, I like to think they helped mold what became In The Pines. One of these films was ASLEEP. It was a film that was a quasi-sequel to AWAKE. The story revolved around Greg D. Burton and his paranoia; followed by Men in Black (no, not Will Smith – check out what I am talking about here) and searching for answers. We began shooting some preliminary scenes, however, it never came to be. There were a lot of character and plot elements that eventually made it into In The Pines (sorry, no Men and black though). Besides the films that never made it, there were the countless rewrites to In The Pines. It has been a project in the making for 3 years. It feels good to be moving forward with a new picture. Filmmaking is something I hold dear to my heart. I can’t wait to show you more. Happy Friday The 13th, Everyone! 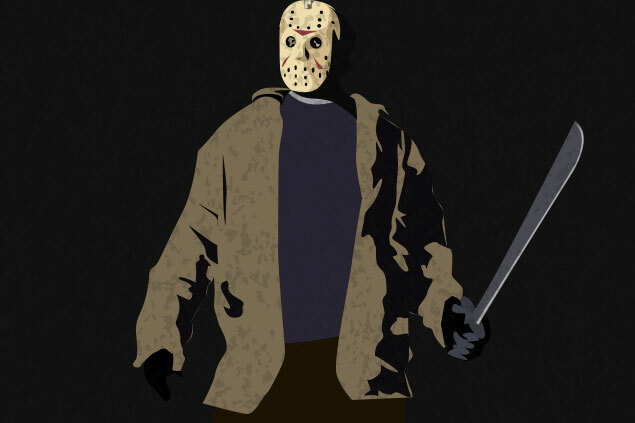 Did you know that in 2015 there are a total of three Friday The 13th’s? That’s right–February, March and November. In celebration of the 2nd 13th this year, I wanted to share–in order–my favorite Friday The 13th films. It has been a while, hasn’t it? We here at NEON REEL took a bit of a hiatus over the last year, for one reason or another. However, have no fear–or have fear–we’re back. In 2015, we’ll have a lot of exciting things to share with you. First up is our new website. It is still a work in progress, but it is a start. You’ll notice that the Homepage has gotten a complete overhaul, along with many other aspects of the site–most notable is that it is now mobile-responsive. That’s right, our audience can enjoy NEON REEL’s content from any mobile device; and desktop, too. We plan to add more features in the coming months, such as: rentals, digital downloads and the ability to order Blu Ray/DVD combo packs on some of our films. In addition to a new website, we have started pre-production on a new film–our biggest endeavor yet! Please check back soon to see everything unfold. A few months back we were approached by Hagerstown Magazine for an interview in their June 2014 Feature Article. It was a pleasure to meet some of the other surrounding filmmakers and to help bring Hagerstown further into light in regards to indie film.